Imogen Stidworthy, a sculptural sound work. Matt’s Gallery, 25 May – 17 July 2011. Nathaniel Mellors, Hippy Dialectics (2010), animatronic sculpture. On exhibition at the ICA, London. Installation view at De Hallen, Harlem. We are pleased to announce our next exhibition, a new commission by Imogen Stidworthy. This new work will be a sculptural installation of sonic, film and architectural elements that explore the borders of language. It considers how we negotiate and make space for ourselves, within the constraints of certain regimes of power, and how these spaces are manifest in the voice and language. Lindsay Seers, It has to be this way2, 2010. Installation, Baltic, Gateshead. Photograph Colin Davidson. It has to be this way2 explores the complexities and uncertainties of history and memory. It was originally commissioned by Mead Gallery, University of Warwick and National Gallery of Denmark (Statens Museum for Kunst). Lindsay Seers, Extramission 6 (Swallowing Black Maria), 2009. Installation view, Gallery TPW, Toronto. Collection Tate Britain. Gallery TPW and Images Festival present the North American premiere of the video installation Extramission 6 (Swallowing Black Maria), 2009, which is part of the Tate Collection. Lindsay Seers, Royal Orb, 2011. This group exhibition broaches three ideas: island life, artistic romanticism and romantic ideas of islands and island culture. Lindsay Seers, The Trilogy (Extramission 2), 2011. Installation view, Rugby Art Gallery and Museum. The Trilogy (Extramission 2), 2005/2010, is on display at Rugby Art Gallery and Museum as part of the annual collections exhibition. The Trilogy (Extramission 2) is a major new acquisition, which was acquired for the collection by the Contemporary Art Society with additional financial support from the V&A Purchase Grant Fund. Nathaniel Mellors, Ourhouse Episode one, 2010-. Video still. 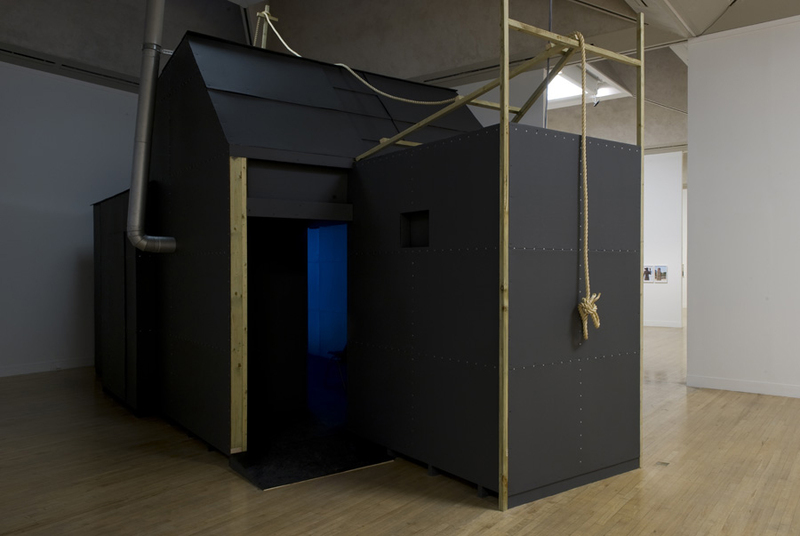 Nathaniel Mellors’ solo exhibition, Ourhouse, at the ICA, London, features Episodes 1, 2 and 4 from his ongoing video series Ourhouse, 2010-, alongside the animatronic sculpture, Hippy Dialectics (Ourhouse), 2010. Mellors has also programmed a series of events in association with Mark Pilkington’s Strange Attractor and Junior Aspirin Records. Nathaniel Mellors, Ourhouse, 2010. Installation view, Hayward Gallery, London. Photograph Alexander Newton. Ourhouse, 2010-, Episode 2, and animatronic sculpture The Object (Ourhouse), 2010, are included in the British Art Show 7 In The Days of the Comet. The exhibition, curated by Tom Morton and Lisa Le Feuvre, will tour to Glasgow from 27 May – 21 August, and then tour to Plymouth later in the year. Nathaniel Mellors, MACGOHANSOC, 2005, Video still. Taking its cue from the social manifesto of the British coalition government, this group exhibition examines UK society through civil movements and actions that have marked its recent history. Mellors is showing his 2005 video work, MACGOOHANSOC. Nathaniel Mellors, Ourhouse Episode 2 ‘Class’, 2010-11. HD Video still. This group exhibition explores the processes of bringing an exhibition into being, making art-production practices visible over an extended period. Mellors will be developing, writing, and rehearsing material towards a new episode of his Ourhouse series. Curated by Francesco Bonami, this group exhibition of twenty international artists marks the 150th anniversary of the Unification of Italy. Nathaniel Mellors will be showing a new video work, Ourhouse – The Nest, filmed at Villa Pisani in the Veneto. Nathaniel Mellors is currently developing new work for this high-profile exhibition, curated by Bice Curiger. The exhibition will be laid out in the Central Pavilion in the Giardini and in the Arsenale, and features 82 artists from all over the world. Mike Nelson, Le Cannibale (Parody Consumption and Institutional Critique), 2008. Installation view. Le Cannibale (Parody Consumption and Institutional Critique), 2008, is on exhibition as part of the Singapore Biennale, Open House, which features 60 artists from 30 countries. Mike Nelson is the first installation artist to be invited to make work in the British Pavilion, which is commissioned by the British Council. This new work, currently under construction, will launch alongside the 54th Biennale di Venezia, in June. Jordan Baseman, No Bloody Chance, 2011. Film still. Baseman’s newest work, No Bloody Chance, 2011, will be shown as part of this group exhibition, which addresses ideas of witness and the archive through digital media. Jordan Baseman, The Dandy Doctrine (A Delightful Illusion), 2009. Film still. The Dandy Doctrine (A Delightful Illusion), 2009, a portrayal of the Soho legend Sebastian Horsley, has been selected for the London Independent Film Festival. Jordan Baseman is soon to become artist in residence at St John’s College, Oxford, for ten weeks. During this time he will be developing new 16mm film work and texts for new a publication to be published by Matt’s Gallery later in the year. Jaroslaw Kozlowski, Soft Protection: The Great Britain and Northern Ireland Version, Matt’s Gallery, 1995. This major new publication features texts by ten writers, each giving different insights into Kozlowski’s practice. The book is edited by Boena Czubak and published by Profile Foundation, Warsaw. Emma Hart, Lost, 2009/2011. Installation view at Cell Project Space. This solo exhibition comprises two video works and a series of photographic lightboxes. Matt’s Gallery now represents Emma Hart, and she will have her first exhibition and new commission at the Gallery, September to October 2011. Alison Turnbull and Rupert Ackroyd, green oak aqua modern, 2011, installation view. Alison Turnbull is exhibiting new work as part of a two-person exhibition with Rupert Ackroyd, made in situ at the Russian Club Gallery. Alison Turnbull, Spring Snow – A Translation, published by Book Works, 2002. David Osbaldeston, MENU Notice, 2010. Orbitecture II is a group exhibition curated by Cedar Lewisohn and Andrew Hunt. The exhibition examines current trends in contemporary art through the work of mainly young artists who deal with important social issues. David Osbaldeston and Joe Devlin: The Provincial Forge, 2009-11. An exhibition featuring work from the Provincial Forge series by David Osbaldeston and Joe Devlin re-presented in London, with a response by Lawrence Leaman and exhibition text by Amy Botfield. This show is part of the Brief Habits programme, curated by Shama Khanna. David Osbaldeston, You Know You Never Know, (detail) 2010. Acme Fire Station will be opening its doors to the public, to celebrate the building’s centenary and its new life as the base for a major artists’ residency programme. David Osbaldeston will be showing new work, alongside other residency artists. The Salon is a group exhibition brings together collaborators, patrons and protégés who have worked with Beaconsfield or who support its role in the artists’ community. Susan Hiller, Work in Progress, Matt’s Gallery, 1980. This critically acclaimed exhibition at Tate Britain provides a timely focus on a selection of Hiller’s key works, including several works commissioned by or shown at Matt’s Gallery: Work in Progress, 1980, An Entertainment, 1990, and The Last Silent Movie, 2007. Paul Rooney, HOMER-HEPHAESTUS, 2011. Installation, Storey Gallery, Lancaster. Storey Gallery has jointly commissioned, with Litfest, a new text-based art work by visual artist Paul Rooney for the Gallery corridor. This will remain in situ on an ongoing basis. Brian Catling, detail from Dorchester Abbey, 2011. A evening of performance and music featuring MacGillivray, D. Gwalia and Brian Catling. Catling will make a new performance in response to the history of the Abbey. This event is part of the Dorchester-on-Thames Festival – see the website for booking details. This event considers issues around the historical representation of disabled people within medical contexts. Four performance artists have been commissioned expressly to respond to the museum’s permanent collection of specimens and curiosities: Brian Catling, Sinéad O’Donnell, Aaron Williamson and Katherine Araniello. Brian Catling, 2011. Photograph by David Tolley. This one-off event will explore the idea of invention as an act of spiritual communion, and the life and writings of Emanuel Swedenborg (1688-1772). The night will consist of a series of individual acts by contemporary performance artists; each act interpreting Emanuel Swedenborg’s investigations into the relationship between matter and spirit. Catling will show a video performance as part of the event.